The Tae Kwon Do Association of Great Britain is Europe's largest single martial arts organisation, with over 20,000 members training in over 600 clubs throughout the UK. We guarantee certified experienced instructors all of whom have undertaken specialist instructors courses, are CRB checked and have full professional indemnity insurance cover. In the last few years the TAGB have been involved with health and fitness promotions with companies such as Nestle, Nationwide Building Society, Sainsbury's, Asda, Cardinal Securities, Disneyland and Rotary International. So when you join the TAGB you can rest assured that you have made the right decision. Tae Kwon-Do was introduced into the United Kingdom during 1967, but owing to subsequent political differences arising in Korea, first two then several competing groups came into existence. A number of these were and are dominated by foreign nationals with financial and politcal interests in what they are doing. 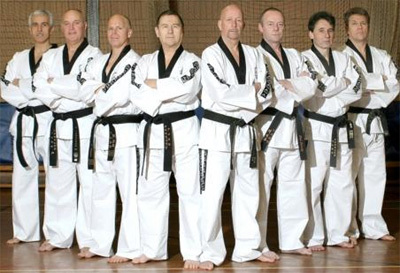 A group of the most senior British Tae Kwon-Do instructors eventually became so disillusioned with the situation that in 1983 they joined forces to form the Tae Kwon-Do Association of Great Britain. The TAGB contains some of the world's top Tae Kwon-Do performers, with several World, European and British champions. Since its inauguration, the TAGB has grown to become the largest and most successful Tae Kwon-Do practising organisation in Britain, with more than 20,000 members training in over 350 schools nationwide. The TAGB is not just concerned with its own development. That is why it has played a leading role in the reunification of British Tae Kwon-Do into one body. In 1988, the TAGB helped foun the British Tae Kwon-Do Council (BTC), this being the only governing body of Tae Kwon-Do to be recognised by the Sports Council. The TAGB also helped found Tae Kwon-Do International, the object of which is to bring together Tae Kwon-Do practioners throughout the World. Tae Kwon-Do International is non-political and it doesn't ttempt to dictate to member countries how they must run their affairs. Since its foundation in 1993, Tae Kwon-Do International has grown to become one of the biggest World Tae Kwon-Do bodies. Its World Championships are amongst the largest and best organised and it draws its participation from every contingent. Profiles are taken from the http://www.tagb.biz/ web site.